This is the 15th year of me putting people on boards. It also offers an opportunity for me to reflect on the changes I have seen over that time and provide some thoughts on some of the key elements I have seen that have gained people board appointments. I began my career as a Headhunter / Executive Search Consultant 15 years ago in London. The first assignment I was involved with, was David Higgins‘ appointment of the CEO of the Olympic Delivery Authority (ODA), in addition to the board appointments of the entire ODA board. My second assignment was for the entire board and Chair of the Equality and Human Rights Commission. These roles were arguably the most significant in the country at that point in time and saw over 2,000 board applications received and took over a year to deliver. 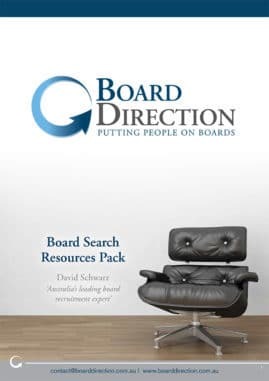 During the remainder of my board recruitment career, I reviewed over 10,000 board- and executive CVs, took briefs from hundreds of Chairs on what they wanted in successful candidates and recruited hundreds of individuals into some of the most significant board appointments in the world! I left board recruitment to begin working at the AICD running their Directorship Opportunities (their job listing) service. During that time, I recognised that the experience I had developed could be utilised on behalf of individuals (rather than commercial clients) to help them gain board appointments… and so Board Direction was born with the explicit intention of helping put people on boards. In the last 15 years, four things have become clear and should frame your thinking about how you might gain your first, or a subsequent, board appointment in 2019. Having spoken to thousands of existing (both good and bad) NEDs in my career, there are three things that successful NEDs have in common. They are curious and they are passionate: I find successful NEDs are people people. They are curious about others, about business and about things they don’t know. This approach means that they rarely consider themselves to be the smartest people in the room; instead, they spend much of their time listening. Overwhelmingly they are passionate – though rarely in a schoolboy or schoolgirl ‘I love your organisation’ sort of way. Instead, they are passionate about what the organisations that they serve do, what the organisations they represent want to achieve or what it is that they offer to their boards. Whatever it is, they are passionate people. They persevere: Perseverance is probably the most common attribute that all successful NEDs have in common. Each recognise that to be successful in their NED career, perseverance is essential. For some, it will be about engaging in the business where others might pull back. For others, it will mean diarising time to dedicate to networking functions, attending events in environments where they might not be known; it might mean taking calls from or having coffee with people that want their help (without an expectation of getting something in return) or giving their time to educate others on what it is to be an NED. They are clear: Successful NEDs have real clarity about a number of different elements. They are clear about what sort of role they want – it might be the scope and scale of an organisation, it might be how much they require to be remunerated or what industry it won’t be in. Equally, if you ask them, they will be able to give you a clear answer to what they offer a board and which organisation they would like to serve. On reflection, there might be one more element. I find a common trait amongst successful NEDs is their desire to serve – rather than be served. They consider themselves stewards of the business/organisation they sit on the board of. This is an important trait, not only because the opposite desire is entirely unattractive but also because it goes some way to evidence their ability to work effectively in a board environment. If you want to find out more, take a look at all my board appointment articles or, if you would prefer to hear what I have to say in person, then one of our Board Search Breakfasts in a city close to you is the way to go.